When Juliette Gordon Low founded the Girl Scouts of America in 1912, she had several goals in mind. The first was to develop the minds of girls to be open to all possibilities and to their own potential, whether they chose to be a homemaker or a community activist. At that time in history, many people were isolated in their own communities, as there was no means to go places. When young women joined the Girl Scouts, they were taken out of these isolating environments and taught outdoor skills to develop their minds, their bodies and their spirituality. In addition, they were taught how to provide service to the communities in which they lived. This legacy has lived on for over one hundred years. 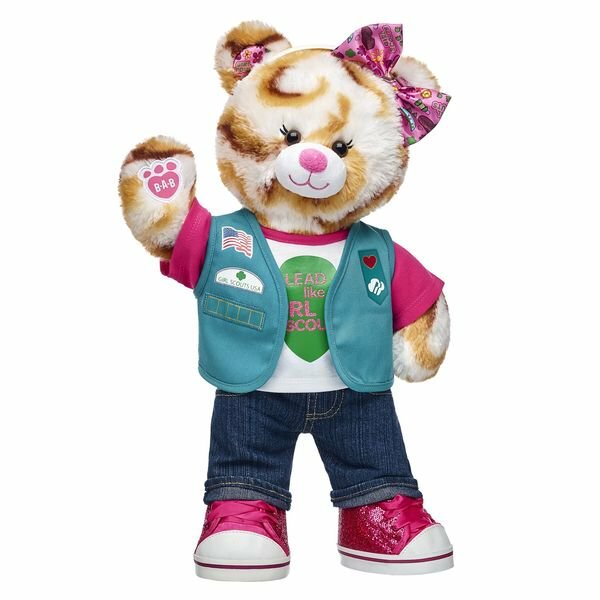 This is an incredibly fun and popular badge for girls to earn. We have become a culture of foodies, whether we are watching shows on The Food Network or The Cooking Channel, pinning recipes that maybe someday we will attempt to make in our own kitchens, or actually trying out new kinds of cuisine. Children today have been exposed to a large variety of foods, but in our fast past, hurried society, many do not spend time in the kitchen…they choose their dinner from a take-out menu. Cooking is a healthier way to eat and gives children the skills they will need when they are on their own. 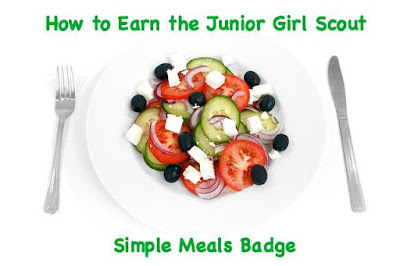 The Junior Girl Scout Simple Meals badge is a fantastic opportunity for leaders to spend time with their girls and teach them something of value. There are the five required steps your girls need to complete. My recommendation is that this badge be earned at one time in one long meeting at a leader or volunteer's house. This is the perfect badge to be accomplished in stations, as the girls will learn more in small groups than in one large one. Having earned cooking badges with my own troop, this worked out well for us. If you choose to do this, field trip permission slips must be filled out and returned, and there needs to be three registered adults at the meeting as well. Set of 10 Disposable Chef's Hats from Amazon. Other quantities can be ordered as well. Give each girl in your troop her own hat and a bunch of markers. Let her write her name in any creative way she wants. Then take a photo of the girls before they start cooking...these won't be as pristine and clean when the meeting is over! Before your troop can get into the kitchen to cook up meals, they will need to learn some basic skills. I was fortunate enough to have a mom was a trained chef and she volunteered when we earned out Brownie cooking badge. If you do not know anyone who can help demonstrate proper techniques, call and see if the local middle school or high school cooking teacher can come in and speak to the girls. Call around and see if a teenage culinary student would like to help. Another idea to learn techniques and to do some of the steps to earn the Simple Meals badge is to have the girls take a cooking class. Local supermarkets have classes for kids, as well as some culinary stores. Check around and see if they will give you a group discount. Breakfast is the most important meal of the day. People need it to start their mental and physical engines. But most kids run out the door without eating, and the ones that do eat have a sugary cereal or yogurt filled with high fructose corn syrup and chemicals and colors. Instead, in a small group, girls can be taught the proper way to crack an egg and make a quick scrambled egg. Another idea is to make French toast sticks or pancakes. 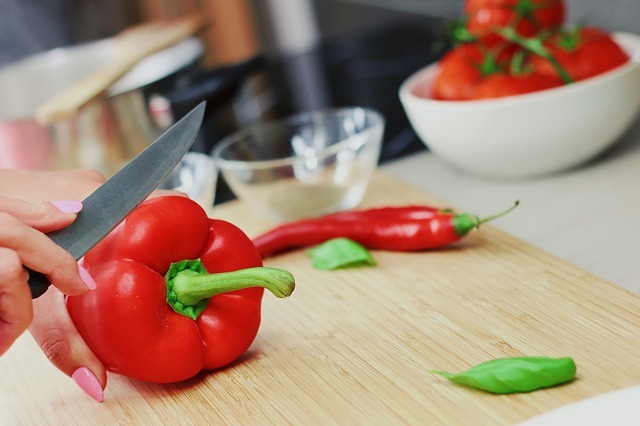 One timesaver is to prepare everything the night before and then all you have to do is just heat up the skillet and start cooking. While a hot breakfast is a delicious idea, on a busy school morning that might not be possible. Instead of a hot breakfast, the girls can have a ready made trail mix. Talk about the importance of protein and have a bunch of bowls with spoons available. Have the girls fill a few baggies with nuts, chocolate chips, granola, and a low sugar cereal. These are portable and can be taken on the bus when the girls are running late. While cooking and baking, clothes need to be protected. 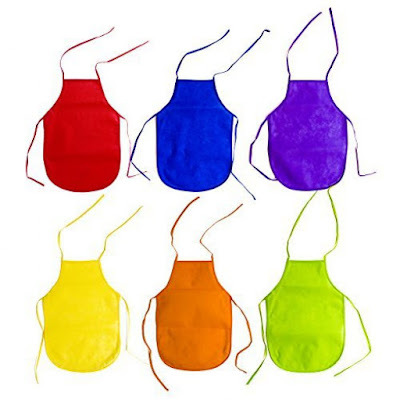 This 12 pack of aprons comes in assorted colors and is another fun reminder of the how they earned this badge. If you plan on working on an Art to Wear badge in the future, have the girls bring this in and they can decorate them with Sharpies or fabric paint. In my opinion, having the girls fix lunch is an easier idea for you to utilize, as you do not require an oven. You can make a cold lunch or on the stove top. If you choose to prepare sandwiches, have a variety of breads for the girls to choose from. You can talk about where they originated. This will most likely be the most popular station of the day. Who doesn’t like dessert? There are thousands of no bake dessert ideas that can be found online. If you want to keep with Girl Scout traditions, then you can make some kind of S’mores dessert or you can make a dessert that involves utilizing Girl Scout cookies as an ingredient. Again, to keep things simple, I would keep to a no bake dessert that can be easily assembled. If you want to bake, then here are Girl Scout trefoil cookie cutters so the girls can make and decorate cookies. This step can be done at home or as the final part of the meeting. The girls need to prepare their own dish or complete meal. Personally, I would have them create their own salad from ingredients that you provide. Use the leftover vegetables from a different station and have the girls pick a protein to top it off. Earning the Junior Girl Scout Simple Meals badge is a delicious way for the girls to use some basic kitchen skills that they need to know.